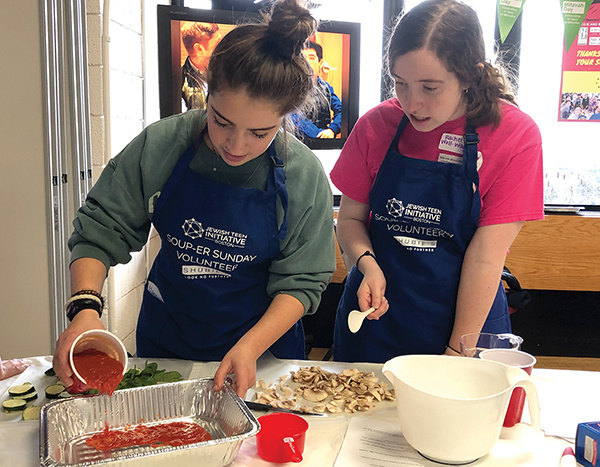 Hannah Goodman and Rachel Wolf-Wagner make lasagna during Soup-er Sunday, organized by the Jewish Teen Initiative to help feed the region’s homeless. NOVEMBER 22, 2018, MARBLEHEAD – The aroma of freshly baked apple pie, soup and lasagna filled the Jewish Community Center in Marblehead this past Sunday as 91 teenagers and 25 adults volunteered on Soup-er Sunday, an event that provides a Sunday meal for the Lynn Emergency Shelter. 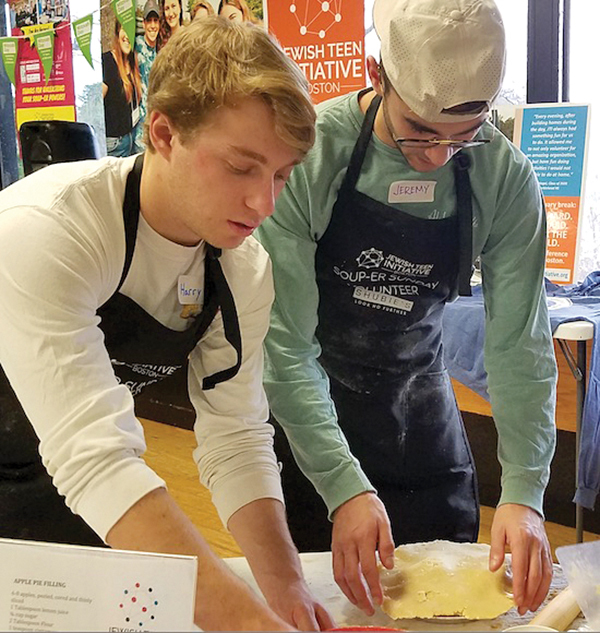 The North Shore teens – who range from 13 to 18 – are members of the Jewish Teen Initiative (JTI), which helped make and deliver 50 pies, four soup pots and 51 lasagnas to the homeless. “It’s really great knowing that we are helping others make food for them, while we are also having fun and meeting new kids,” said Gillian Jacobs, 13, of Swampscott. Yachad, the National Jewish Council for Disabilities, infuses a sense of inclusion in the community, according to Bonnie Weiss of Yachad. “Helping to cook and prepare food here today with other groups is a great way to do that,” she said. Soup-er Sunday, now in its 10th year, has become one of the largest youth events organized by the JTI, according to its founder Adam Smith. Harry Copeland and Jeremy Rubin put the finishing touches on an apple pie during Soup-er Sunday. While the pies were being prepared by the teens, others were making boxes to put them in. Standing by was Eva Goldstein, of the Lynn Shelter Association who planned to deliver the food for Sunday’s dinner. Goldstein is a Bates College graduate who enrolled in a state-funded year of service at the Lynn Shelter Association through the Commonwealth Corps, whose goal is to rebuild communities, address unmet community needs, and increase volunteerism. Also on Sunday, a parallel program for elementary and middle school students also took place at Temple Emanu El in Marblehead, where the youth prepared food for My Brother’s Table. The event was supported by many organizations including the Lappin Foundation, Pediatric Healthcare Associates, Leslie and Bob Ogan and Shubie’s Marketplace.